All right, Keertana. 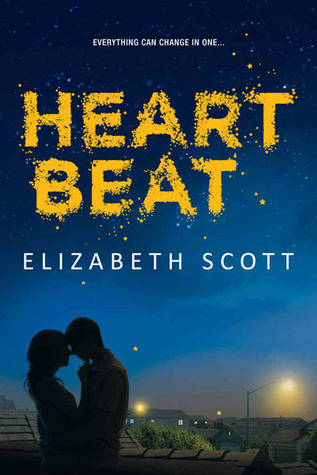 I shied away from this book because of the topics and because I haven't had a whole lot of luck with most of this author's lighter contemporaries, but the fact that the book you talk about first is LIVING DEAD GIRL means that you are the same sort of Elizabeth Scott reader than I am. I am VERY interested in reading this now despite any other negative reviews or nonsense about unlikeable heroines. Thank you so much much for the review! I'm adding a note to myself on my GR shelf. When a book gets a lot of negative reviews or evokes strong feelings, that's when I take a second look (it's those meh books that I nod and say, "Yeah, probably not gonna read that one."). And Emma sounds like an interesting character, even with her bad attitude. I think you managed to enjoy this one a little more than I did, Keertana. I really struggled with Emma, and I wish I could have put aside my disdain, but clearly I failed! Great review though, and I'm glad you enjoyed it! I have seen quite a few mixed reviews for this one Keertana, so it was nice to read a more positive opinion. I'm glad you took a chance on this one despite your lack of success with some of her other novels, and I'm completely intrigued by this actual bad boy you mention. I second that yes, please! You have me curious. I want to try this one now. I want to see if I can enjoy a book with and unlikable heroine. Yep, I will have to try it, but I may library book it. I'm pulling out my Kindle now to get my copy out to read. You make a really strong case for this one. I was taking my time to get to it, sad and bitter isn't what I need right now. But angry, yes, I can feel that, and work with it. BTW, have you tried listening to Scott's books on audio? I tried Love You, Hate You, Miss You and really enjoyed it that way. It's the only other book of hers I've read. So you're the black sheep when it comes to books. I did not know that about you. And yet we have agreed on several newish books. Good to know! I am scared of this one. Besides reading a bunch of different reviews, the emotional aspect of it doesn't seem to fit my current state of mind at this time. I think I would have to wait a couple of months and then hope that books like these wont leave me feeling completely crushed. But I heard it was great! I have a feeling I wouldn't be able to get past unlikable Emma. Just from your review she seems utterly self-centered. I can understand that she's grieving, but I lost my mother when I was young too and this did not take away all my reason and logic and make me unfeeling towards the suffering of others around me. Her step father had to be feeling the loss as well, and was he supposed to just let his son die too because the mother was brain dead? Most parents would do exactly what Dan did. Well, consider me intrigued! I saw all the negative reviews begin to pile up for this book and immediately dismissed it. But maybe it's worth re-evaluating whether I should read it. I also like my unlikable heroines, provided there is a reason that I can understand for their behavior. Your description here reminds me a bit of a Courtney Summers character - which is never a bad thing in my book! Thoughtful review as always, Keertana! I really struggled with this one. I have never really HATED a MC. At least not like this. I didn't understand her AT ALL. Sometimes I can look past that, but I wasn't really able to so much this time. However I liked the writing and the subject (other than her anger) and I liked her relationship with Caleb. So really, the only thing I didn't like was Emma, but I REALLY didn't like her. It seems like most are able to connect with her in some way or understand why she's the way she is/was, but I didn't really. I would start to see something that made me feel I might, but then she'd do something that made me angry again. I'm glad you enjoyed it more than I did! "Give me an angry, bitter, lashes-out-at-everyone heroine over a Bella Swan any day." Yes! I have seen SO many negative reviews that point out Emma's attitude as the major reason the book didn't work for them, but I would have cried foul if she weren't unlikable, given everything she has been through. Wonderful review, Keertana! I think this author's books are a bit too depressing for me in general, and I've started to avoid grief books, because they make me sad and often deal with issues the same ways. But I'm really glad to see that this one worked well for you. It is definitely a big mark in its favor. I particularly like the supportive friend Olivia as well as the love interest who is a boy who has actually done bad things. I don't mind an unlivable heroine, though as someone no longer in my teens, I can imagine that Emma might get on my nerves some. But you do make a strong case for this story, and it is now more firmly on my radar.